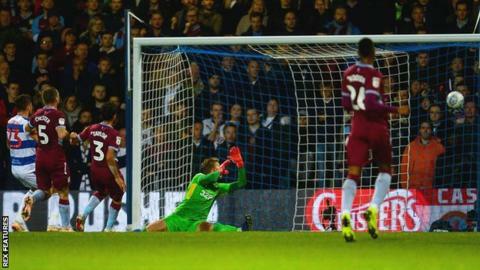 Queens Park Rangers continued their fine form in the Championship by beating Aston Villa at Loftus Road to record their fourth win in a five-match unbeaten run. After Jack Grealish had hit the post with a long-range free-kick for the visitors, Pawel Wszolek put the R's ahead seven minutes before the break with an emphatic finish off the underside of the bar. Tammy Abraham deflected a free-kick wide after the break and Rangers keeper Joe Lumley denied Yannick Bolasie with a low stop as Villa sought an equaliser. But the hosts survived pressure in the second half to move up to seventh in the table, one point off the play-offs, while Villa have won just one of their past seven league games. After tasting victory in his first game in charge against Swansea, Dean Smith has now seen his Villa side fall to back-to-back defeats and slip to 16th, six points off the top six ahead of the rest of the weekend's fixtures. Both sides had chances in a lively opening quarter of an hour, with John McGinn and Grealish firing wide and Luke Freeman and Eberechi Eze testing Villa keeper Orjan Nyland. The hosts took the lead when the Villa defence momentarily switched off, with Wszolek running between James Chester and Neil Taylor to latch on to Geoff Cameron's lofted through ball and power in from 14 yards out. Toni Leistner and Angel Rangel put in crucial blocks to help secure a third successive clean sheet for Steve McClaren's side, who have recovered remarkably after losing their first four games of the season. Match ends, Queens Park Rangers 1, Aston Villa 0. Second Half ends, Queens Park Rangers 1, Aston Villa 0. Offside, Aston Villa. Jack Grealish tries a through ball, but Jonathan Kodjia is caught offside. Attempt missed. Jack Grealish (Aston Villa) left footed shot from outside the box misses to the right following a set piece situation. Glenn Whelan (Aston Villa) wins a free kick on the left wing. Corner, Aston Villa. Conceded by Angel Rangel. Attempt blocked. Tammy Abraham (Aston Villa) right footed shot from the centre of the box is blocked. Assisted by John McGinn. Corner, Queens Park Rangers. Conceded by Ørjan Nyland. Attempt saved. Josh Scowen (Queens Park Rangers) right footed shot from outside the box is saved in the top centre of the goal. Assisted by Nahki Wells. Ørjan Nyland (Aston Villa) wins a free kick in the defensive half. Corner, Queens Park Rangers. Conceded by Neil Taylor. Attempt missed. Pawel Wszolek (Queens Park Rangers) left footed shot from outside the box misses to the right. Assisted by Josh Scowen. Attempt blocked. Jack Grealish (Aston Villa) right footed shot from the centre of the box is blocked. Assisted by Yannick Bolasie with a cross. Attempt saved. Nahki Wells (Queens Park Rangers) left footed shot from the left side of the box is saved in the bottom left corner. Assisted by Luke Freeman. Attempt missed. Josh Scowen (Queens Park Rangers) right footed shot from outside the box is close, but misses to the left. Assisted by Nahki Wells. Foul by Axel Tuanzebe (Aston Villa). Foul by Yannick Bolasie (Aston Villa).